Although the Pensacola Blue Wahoos are a baseball team, our mission goes beyond winning championships on the field. Our Mission: To improve the quality of life for the people living in Pensacola. Our Vision: To make Pensacola the greatest place to live in the world. Entering its eighth season, Blue Wahoos Stadium is widely considered one of the premier facilities in Minor League Baseball. Recently named the "Best View" in Double-A baseball, the ballpark has established itself as one of the best places to enjoy a Minor League Baseball game in the country. A three-time recipient of the Southern League Ballpark of the Year, Blue Wahoos Stadium welcomed over 2,000,000 fans in its first seven seasons, finishing first or second in the league in attendance five times. The stadium was designed by Populous, a company renowned for creating outstanding sports facilities including numerous Major League ballparks, as well as NFL, NBA and NHL stadiums. The multi-use facility was designed to be used year-round by the community, hosting college football games, youth tournaments, concerts, and other community events throughout the year. With a capacity of 5,038 fans, Blue Wahoos Stadium is the smallest in the Southern League, allowing fans to get closer to the players and the action than any other park in the league. Nestled alongside the water in Pensacola's Community Maritime Park, the field provides unbeatable views of the Pensacola Bay. 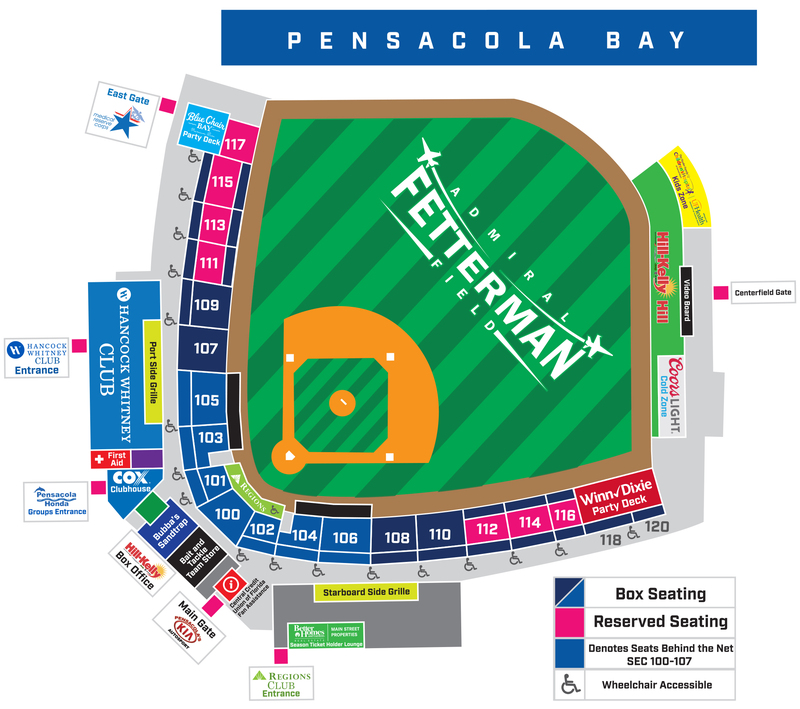 The playing surface at Blue Wahoos Stadium was officially named Admiral Fetterman Field in 2015 in honor of the late Admiral Jack Fetterman who was instrumental in the creation of Community Martime Park for the Pensacola community. Blue Wahoos Stadium and the surrounding Maritine Communty Park were built to be used by the Pensacola community throughout the season, not just for Wahoos baseball games. Over 200 events were held at the stadium in 2018 with more than twice as many non-baseball events held than baseball games. To learn more about the numerous events held at the ballpark throughout the year, click here! The day after Quint and Rishy Studer attended their first Pensacola Pelicans game in 2002, Quint noticed an article in the Pensacola New Journal noting that the team might be available for sale. At the time, the Pelicans were an unaffiliated independent professional baseball team playing at a local junior college in Pensacola as a member of a start-up six-team league. After inquiring into the franchise, the Studers were offered the opportunity to own the Pelicans and took it. Over the next few years, they invested heavily in the team and the league, at times covering opposing players' salaries or paying for other teams to keep competition on the field. With the success of the franchise, they were able to move the Pelicans to the stronger Central League and then the American Association, traveling as far as St. Paul, Minn. to play games. With the team playing at a local college, the Studers began looking for ways to build the team its own stadium in downtown Pensacola. In 2009, after a long referendum process, they began constructing both a baseball stadium and a public park on 27 acres of heavy-polluted but beautiful waterfront land in downtown. While the park and stadium were under construction, the opportunity to purchase the Carolina Mudcats, then the Double-A affiliate of the Cincinnati Reds, arose. In 2010, the Studer family officially purchased the Mudcats and moved them to Pensacola, re-naming them the Pensacola Blue Wahoos through a branding contest voted on by local fans. Blue Wahoos Stadium officially opened in 2012 with the Blue Wahoos playing their first season in affiliated baseball in the Southern League as the Double-A affiliate for the Reds. In their short history since, the team has established itself as one of the most successful businesses in Minor League Baseball, winning the Southern League Organization of the Year four times in their first seven seasons, rating first in all of baseball in Fan Experience, and consistently being ranked one of the top places to work in the nation. In October 2018, the Blue Wahoos announced that they had reached a two-year Player Development Contract to become the Double-A affiliate of the Minnesota Twins, an agreement that will begin in 2019 and bring some of the top prospects in the game of baseball to Blue Wahoos Stadium.